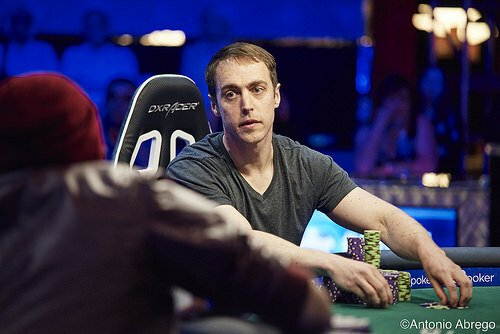 Jason DeWitt opens the action with a raise to 1,050,000. Garrett Greer calls from the big blind. The flop comes and both players check. On the turn, Greer puts out a bet of 500,000. DeWitt calls. The river is the . Greer makes a repeat bet of 500,000. This time, DeWitt pops it up to 2,000,000. "How can you have a nine here?" Greer asks. "I don't understand." Eventually Greer decides to fold. "Good fold," DeWitt says, turning up the . "My heater is real."